Welcome! This month we interview Maja Mataric, Vice Dean for Research and the Director of the Robotics and Autonomous Systems Center at the University of Southern California. How did you become interested in robotics and AI? When I moved to the US in my teens, my uncle wisely advised me that “computers are the future” and that I should study computer science. But I was always interested in human behavior. So AI was the natural combination of the two, but I really wanted to see behavior in the real world, and that is what robotics is about. Now that is especially interesting as we can study the interaction between people and robots, my area of research focus. Do you have any suggestions for people interested in doing outreach to K-12 students or the general public? Getting involved with K-12 students in incredibly rewarding! I do a huge amount of K-12 outreach, including students, teachers, and families. I find the best way to do so is by including my PhD students and undergraduates, who are naturally more relatable to the K-12 students: I always have them say what “grade” they are in and how much more fun “school” is once they get to do research. The other key parts to outreach include letting the audience do more than observe: the audience should get involved, touch, and ask questions. And finally, the audience should get to take something home, such as concrete links to more information and accessible and affordable activities so the outreach experience is not just a one-off. Above all, I think it’s critical to convey that STEM is changing on almost a daily basis, that everyone can do it, and that whoever gets into it can shape its future and with it, the future of society. How do you think robotics or AI researchers in academia should best connect to industry? Recently connections to industry have become especially pressing in robotics, which has gone, during my career so far, from being a small area of specialization to being a massive and booming area of employment opportunity and huge technology leaps. This means undergraduate and graduate students need to be trained in latest and most relevant skills and methods, and all students need to be inspired and empowered to pursue skills and careers in these areas, not just those who self-select as their most obvious path; we have to proactively work on diversity and inclusion as these are clearly articulated needs by industry. There are great models of companies that have strong outreach to researchers, such as Microsoft and Google to name two, both holding annual faculty research summits and having grant opportunities for faculty to connect with their research and business units. As in all contexts, it is best to develop personal relationships with contacts at relevant companies, as they tend to lead to most meaningful collaborations. It’s hard to pick one, but here are, briefly, three that are interesting: 1) I had to actively choose whether to speak up against unfair treatment when I was still pre-tenure and in a very under-repreresented group, or to stay silent and not make waves. I spoke up and never regretted being true to myself. 2) I had to choose whether to take part of my time away from research to get involved and stay involved in academic administration. I chose to do so, but also chose to never let it take more than the official half time, and never stomp on my research. 3) I had to choose whether to leave academia for a startup or industry. These days, that is an increasingly complex choice, but as long as academia allows us to explore and experiment, it will remain the best choice. The successes of my students and of my research field. Seeing my PhD students receive presidential awards while having balanced lives with families and still responding to my emails just makes me beam with pride. 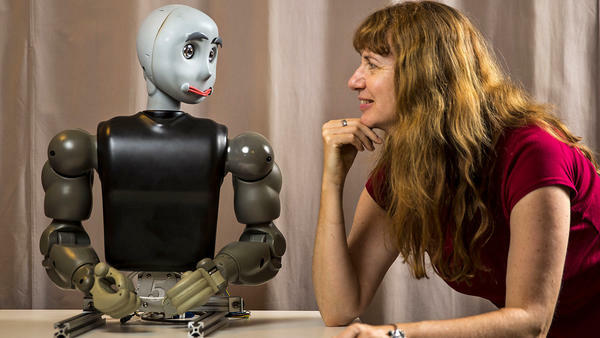 Pioneering a field, socially assistive robotics, that focuses on helping users with special needs, from those with autism to those with Alzheimer’s, to reach their potential. Seeing that field become established and grow from the enthusiasm of wonderful students and young researchers is an unparalleled source of professional satisfaction. Nobody, no matter how senior or famous, knows how things are going to work out and how much another person can achieve. So when receiving advice, believe encouragement and utterly ignore discouragement. I am fortunate to be very stubborn by nature, but it was still a hard lesson and I see too many young people taking advice too seriously; it’s good to get advice but take it with a grain of salt: keep pushing for what you enjoy and believe in, even if it makes some waves and raises some eyebrows. What would you have chosen as your career if you hadn’t gone into robotics? I think about that when I talk to K-12 students; I try to tell them that it is fine to have a meandering path. I finally understand that what really fascinates me is people and what makes us tick. I could have studied that from various perspectives, including medicine, psychology, neuroscience, anthropology, economics, history… but since I was advised (by my uncle, see above) to go into computer science, I found a way to connect those paths. It’s almost arbitrary but it turned out to be lucky, as I love what I do. I have no typical day, they are all crazy in enjoyable ways. I prefer to spend my time in face-to-face interactions with people, and there are so many to collaborate with, from PhD students and undergraduate students, to research colleagues, to dean’s office colleagues, to neighbors on my floor and around my lab, to K-12 students we host. It’s all about people. And sure, there is a lot of on-line work, too, too much of it given how much less satisfying it is compared to human-human interactions, but we have to read, review, evaluate, recommend, rank, approve, certify, link, purchase, pay, etc. Since I got involved with socially assistive robotics, I truly love all my research projects: we are working with children with autism, with reducing pain in hospital patients, and addressing anxiety, loneliness and isolation in the elderly. I share with my students the curiosity to try new things and enjoy the opportunity to do so collaborative and often in a very interdisciplinary way, so there is never a shortage of new things to discover, learn, and overcome, and, hopefully, to do some good. How do you balance being involved in so many different aspects of the robotics and AI communities? With daily difficult choices: it’s an hourly struggle to focus on what is most important, set the rest aside, and then get back to enough of it but not all of it and, above all, to know what is in what category. I find that my family provides an anchoring balance that helps greatly with prioritizing. “Wall*E”: it’s a wonderfully human (vulnerable, caring, empathetic, idealistic) portrayal of a robot, one that has all the best of our qualities and none of the worst. After that, “Robot and Frank” and “Big Hero 6”. In the August 1 post, I offered a more detailed view of “algorithm” in “Algorithmic Transparency”, particularly in some machine learning software. The example was about systems involving neural networks, where algorithms in the technical sense are likely not the cause of concern, but the data used to train the system could lead to policy issues. On the other hand, “predictive” algorithms in systems are potentially a problem and need to be transparent and explained. They are susceptible to unintentional — and intentional — human bias and misuse. Today’s post gives a particular example. Predictive policing software, popular and useful in law enforcement offices, is particularly prone to issues of bias, accuracy, and misuse. The algorithms are written to determine propensity to commit a crime and where crime might occur. Policy concerns are related to skepticism about the efficacy and fairness of such systems, and thus accountability and transparency are very important. As stated in Slate, “The Intercept published a set of documents from a two-day event in July hosted by the U.S. Immigration and Customs Enforcement’s Homeland Security Investigations division, where tech companies were invited to learn more about the kind of software ICE is looking to procure for its new ‘Extreme Vetting Initiative.’ According to the documents, ICE is in the market for a tool that it can use to predict the potential criminality of people who come into the country.” Further information on the Slate article is available here. The AI community should help investigate algorithmic accountability and transparency in the case of predictive policing and the subsequent application of the algorithms to new areas. We should then discuss our SIGAI position and public policy. Our July 15th post summarized the USACM-EUACM joint statement on Algorithmic Transparency and Accountability (ATA) and introduced the ATA FAQ project by the USACM Algorithms Working Group. Their goal is “to take the lead addressing the technical aspects of algorithms and to have content prepared for media inquiries and policymakers.” The SIGAI has been asked to contribute expertise in developing content for the FAQ. Please comment to this posting so we can collect and share insights with USACM. You can also send your ideas and suggestion directly to Cynthia Florentino, ACM Policy Analyst, at cflorentino@acm.org. “Q: What is an algorithm? “Q: Can algorithms be explained? Why or why not? What are the challenges? This post raises an issue with the use of the term “algorithm” in the era of Big Data in which the term “machine learning” has been incorporated into the field of data analytics and data science. The AI community needs, in the case of the ATA issues, to give careful attention to definitions and concepts that enables a clear discourse on ATA policy. A case in point, and we welcome input of SIGAI, is the central role of artificial neural networks (NN) in machine learning and deep learning. In what sense is a NN algorithmic? Toward the goal of algorithmic transparency, what needs to be explained about how a NN works? From a policy perspective, what are the challenges in addressing the transparency of a NN component of machine learning frameworks with audiences of varying technical backgrounds? The mechanisms for training neural networks are algorithmic in the traditional sense of the word by using a series of steps repeatedly in the adjustment of parameters such as in multilayer perceptron learning. The algorithms in NN training methods operate the same way for all specific applications in which input data is mapped to output results. Only a high-level discussion and use of simplified diagrams are practical for “explaining” these NN algorithms to policymakers and end users of systems involving machine learning. On the other hand, the design and implementation of applications involving NN-based machine learning are surely the real points of concern for issues of “algorithmic transparency”. In that regard, the “explanation” of a particular application could discuss the careful description of a problem to be solved and the NN design model chosen to solve the problem. Further, (for now) human choices are made about the number and types of input items and the numbers of nodes and layers, method for cleaning and normalizing input data, choice of an appropriate error measure and number of training cycles, appropriate procedure for independent testing, and the interpretation of results with realistic uncertainty estimates. The application development procedure is algorithmic in a general sense, but the more important point is that assumptions and biases are involved in the design and implementation of the NN. The choice of data, and its relevance and quality, are eminently important in understanding the validity of a system involving machine learning. Thus, the transparency of NN algorithms, in the technical sense, might well be explained, but the transparency and biases of the model and implementation process are the aspects with serious policy consequences.